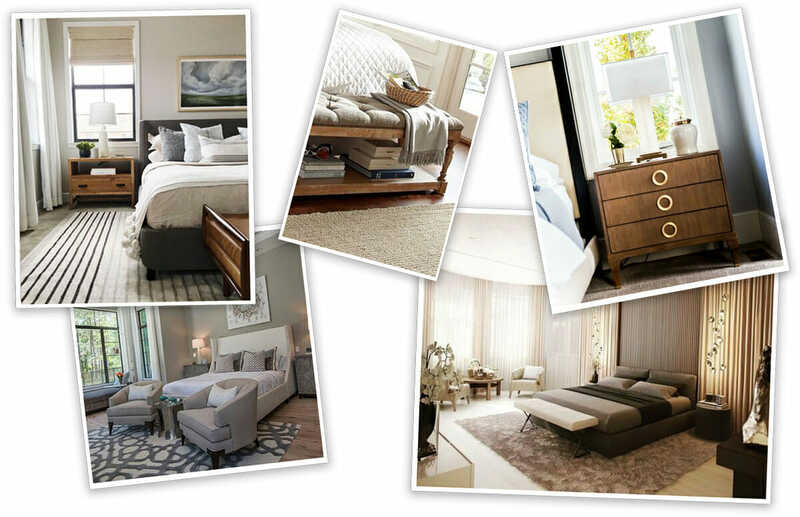 The images provided by the client are all relaxing bedroom interior designs. They all have neutral palettes and a predominance of solid colors that create a simple and calm atmosphere. In the initial stage of a project, inspiration pictures are particularly important as they allow the designer to better understand what the client likes. In this case, the rooms are not all in the same style, but they still provide a good starting point. Then, the initial concept design will be tweaked along the process to match the exact needs of the client. To better use the large amount of space in this bedroom, the proposed design creates three areas: reading, sleeping and storage. The reading nook is conveniently placed next to the big windows, which allows to take a glance to the outdoors before going to bed. Next to it, the sleeping area is grounded by a big rug, that fits both the bed and a bench. And on the opposite wall, a dresser and a big mirror create the perfect storage corner, while leaving enough clear space to walk around. Getting to see the design upfront in a 3D image is a huge benefit of online interior design as it really helps to visualize the end result. In this case, it also proves that the space will flow nicely without feeling cluttered or empty. 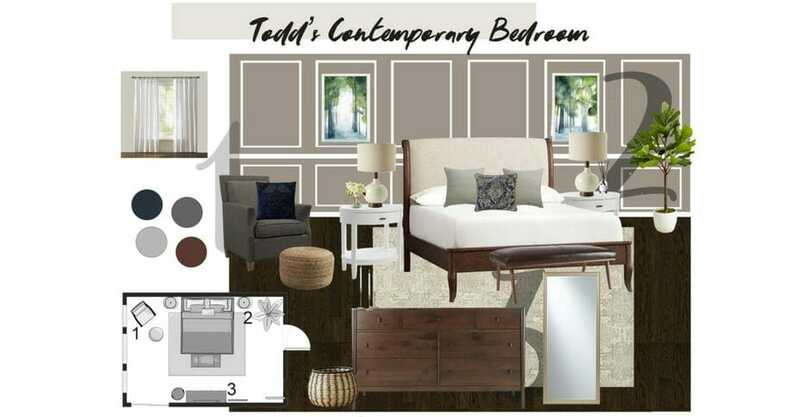 Looking at this final bedroom design, everything talks about calm. 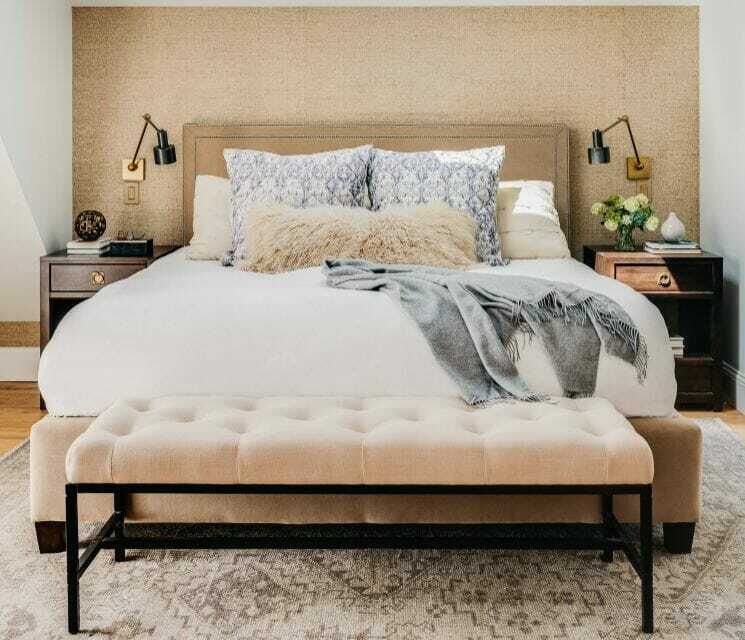 The designer Paaj has chosen transitional bedroom furniture for the space and has used a mix of natural colors and textures to give the room character. Art is always a good idea to decorate a room and here the two paintings fit into the moldings, giving them a fresher and more modern look. The choice of these specific artworks is perfect for this space both to introduce a touch of color and to continue the relaxing vibe. Blues and greens belong to the more soothing half of the color wheel and the watercolor finish gives a dreamy feel that works perfectly in a bedroom. The same green of the art is then matched with a plant and some flowers, that also add more life to the space. 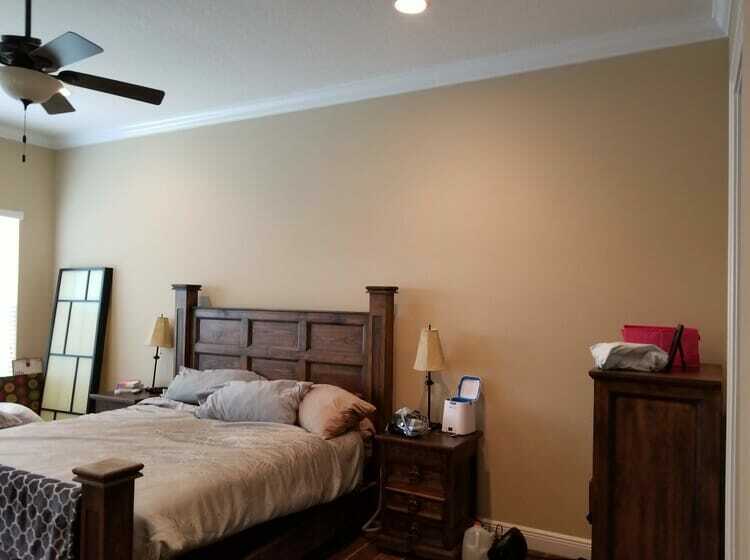 The walls have two different colors: a light gray (Agreeable Gray by Sherwin Williams) and a darker one (Keystone Gray by Sherwin Williams). Painting a room with two colors is often a good choice. It creates interest and helps to give light to the space. In this case then, the darker gray highlights the wall behind the bed, making the white wall molding pop as the focal point. 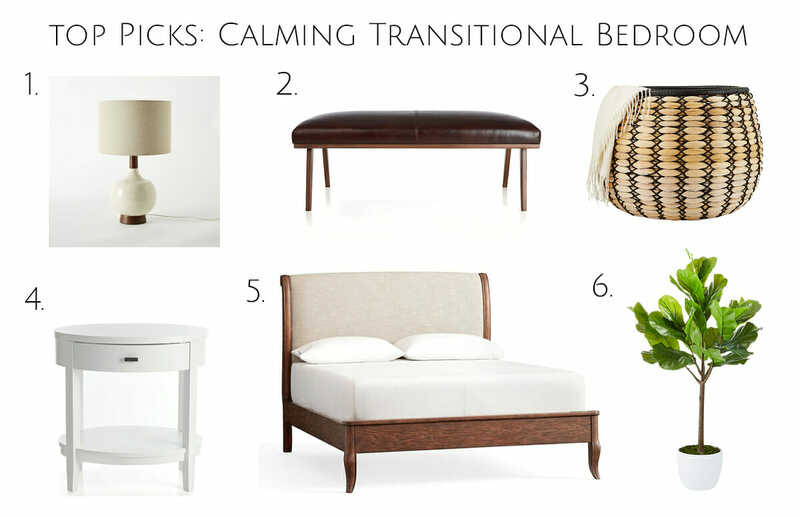 To achieve a transitional bedroom interior design, the designer has mixed a variety of materials in the furniture. For instance, having the nightstands not match the finish of the bed gives movement and contributes to lighten up the space. The leather bench is also mismatched and adds an element of texture. Finally, in the reading nook, a traditional armchair pairs with a woven pouf that almost has a boho vibe. Certainly an unexpected detail, but one that adds a lot of interest to the space! Overall this bedroom looks interesting, fresh and definitely relaxing. And we’re sure the client will have sweet dreams in it! 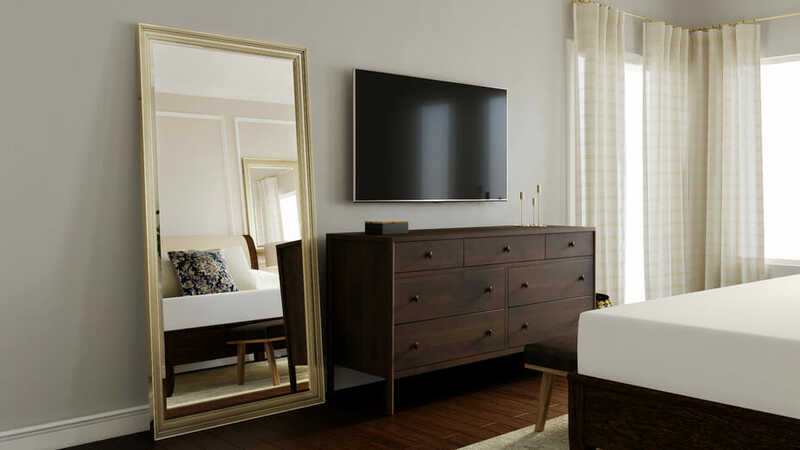 Thanks to designer-client communication the client has a sanctuary filled with transitional bedroom furniture that he loves. 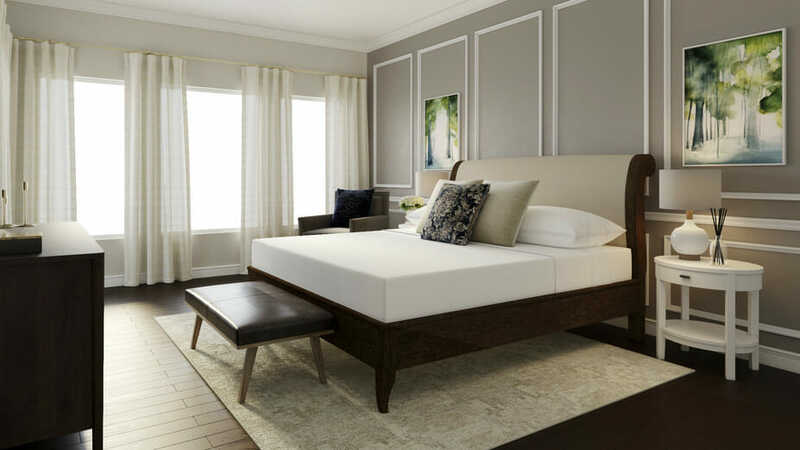 As a result, the design is space-effective and ensures that the bedroom is light and uplifting. Natural bedroom decor, a great layout, and a happy client mean that this is certainly another successful Decorilla project! 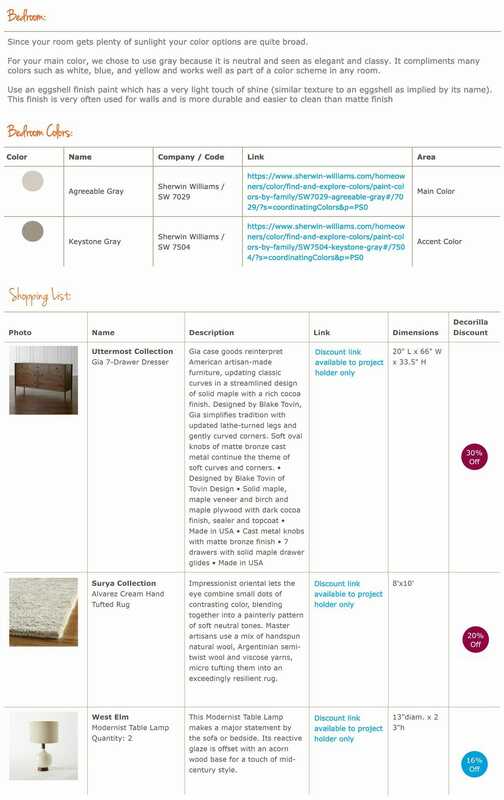 If you’re ready to transform your home into the dream you deserve then schedule a free interior design consultation. You’ll receive expert advice, various proposals from different designers and until you find your dream design!